For the king of Iberia, see Artaxias I of Iberia. 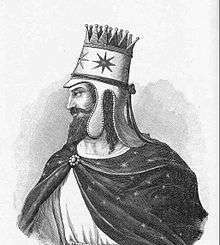 Artaxias I (Greek: Άρταξίας, Artashes Armenian: Արտաշես; reigned 190/189 BC – 160/159 BC) was the founder of the Artaxiad Dynasty whose members ruled the Kingdom of Armenia for nearly two centuries. By the end of the 3rd century BC, the kingdom of Armenia was made up of around 120 dynastic domains ruled by nakharars, loosely united under the Orontid kings of Greater and Lesser Armenia. Even though Alexander the Great did not conquer Armenia, Hellenistic culture had strongly impacted Armenian society. When Antiochus the Great wrestled Armenia from Orontid rule, he appointed Artaxias as strategos. Following his monarch's defeat by the Romans at the Battle of Magnesia in 190 BC, Artaxias and his co-strategos Zariadres revolted and, with Roman consent, began to reign autonomously with the title of king; Artaxias over Greater Armenia and Zariadres over Sophene/Lesser Armenia. 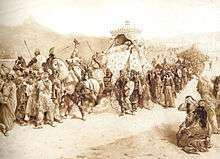 According to Strabo and Plutarch, Artashes also founded the Armenian capital Artashat (Artaxata) with the aid of the Carthaginian general Hannibal who was being sheltered from the Romans within Artashesians' court. The population of the previous Yervanduni (Orontid) capital of Yervandashat was transferred to Artashat (Artaxata). Over a dozen stone boundary markers have been discovered on the territory of modern Armenia from the time of the reign of Artashes with Aramaic inscriptions, before their discovery the existence of these stones was attested by Moses of Chorene. In these inscriptions Artashes claims descent from the Yervanduni (Orontid) Dynasty: King Artaxias, the son of Orontid Zariadres. From the time of the state of Hayasas, until that of Artaxias I, more than one thousand years elapsed, and during that period the Hayasas, the Armens, the people of Nairi and other ethnic elements were integrated, became one nation, spoke the same language, and lived together in a country that became known as Armenia. Artaxias was married to Satenik, daughter of the king of Alans. They had six sons: Artavasdes (Artavazd), Vruyr, Mazhan, Zariadres (Zareh), Tiran and Tigranes (Tigran). Artaxias founded a capital, Artaxata on the Araks River near Lake Sevan. 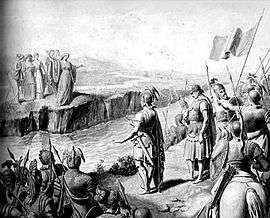 Hannibal took refuge there at his court when Antiochus could not protect him any longer. Artaxias was taken captive by Antiochus IV Epiphanes when he attacked Armenia around 165 BC. ↑ Pliny, Natural history 6.9.